Mercedes-Benz has introduced the latest version of its luxurious CLS coupé – a model first launched in 2003. A mid-year arrival is planned for the new CLS coupé here. It was designed to create an entirely new vehicle segment, and one that others have since attempted to replicate. The CLS combines the elegance and dynamism of a coupé with the comfort and functionality of a saloon. Now in its third generation, it continues to radiate that self-assured sense of sportiness so characteristic of its predecessors, within its spacious and functional four-door form. Viewed from the outside, the new CLS has clear echoes of the Mercedes-AMG GT. 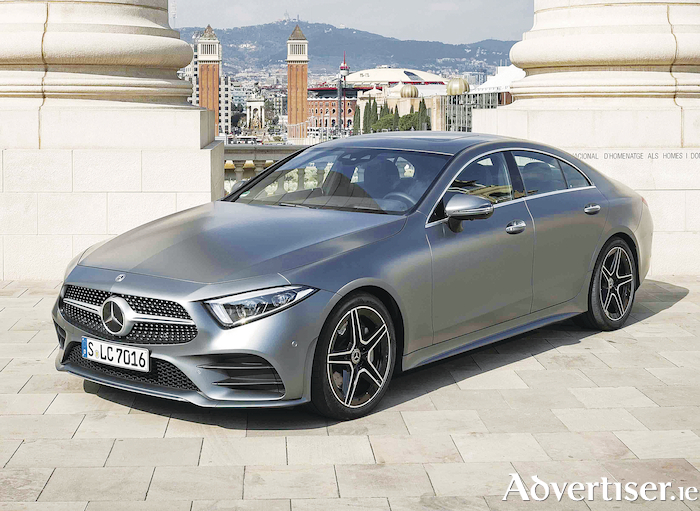 This is reflected in its striking front-end with its single louvre diamond grille and wide, pronounced headlamps – two marks of the Mercedes-Benz coupé. Its outstanding aerodynamics and 0.26 Cd value are evident in its sporty, low-profile, frameless side windows and high, arching waistline. To the rear, its muscular shoulder line blends smoothly into a flat rear end, while other coupé-like features include two-section tail lights and rear bumper with inset reflectors and registration plate. Inside, the high-grade choice of materials and finish used to create its aero-like cockpit is evident throughout. For the first time, seats designed exclusively for the CLS can now accommodate five occupants. Backrests can be folded to expand its somewhat generous 520-litre luggage compartment. Other features within what Mercedes-Benz calls a sporty, fully digital ‘width-accentuated’ cabin include individually adjustable 64 colour ambience lighting, illuminated air vents, hand-finished appearance upholstery, and air conditioning with colour-guided, red/blue, warmer/cooler temperature control. Describing the new CLS as "a car created for the discerning motorist" who seeks elegance, luxury and prestige in an ultra-modern, eye-catching and timeless design that is vibrant and enjoyable to drive, Ciaran Allen, sales manager for Mercedes-Benz passenger cars in Ireland, confirms prices will be announced closer to its market introduction next May/June. Noting the likelihood that they will be "within reach" of current levels, Allen says the intention would be to hold CLS prices at a "competitive level consistent with market conditions and the expressed determination of Mercedes-Benz to offer value at all points across its model range”. Sharing features in common with the S-Class, Mercedes-Benz says the new CLS comes with all of the latest generation touch-screen infotainment, safety and driver assistance systems. Within an impressive array of optional safety and driver assistance features are systems that assist in maintaining speed limits and others that give protection in various ways. Of these, one prepares occupants for the anticipated noise should a collision occur. Improved camera and radar systems provide an enhanced view of surrounding traffic while map and navigation data can be used to calculate driving behaviour. In stop-‘n-go traffic – when stops are less than 30 seconds duration, the CLS can reduce stress on the driver by progressing forward automatically. A completely new engine line-up powers the new CLS. Initially, it comprises 6-cylinder, in-line diesel and petrol units with 4MATIC models included in the offering. Diesels – with aluminium block and steel pistons – are engineered with stepped-bowl combustion two-stage turbo-charging and, for the first time, variable valve-lift control. Components used in reducing emissions are installed directly on the engine. Three diesel units are available at launch: a CLS 300d, expected to be the popular choice in Ireland, along with a CLS350d 4MATIC and CLS400d 4MATIC. Following, in early-2019, will be a CLS 220d version. Mercedes-Benz claims vital stats show the 300d unit delivering 180kW/245hp and 500Nm torque. The 350d unit delivers 210kW/286hp and 600Nm torque, while the more powerful 400d version has 250kW/340hp and 700Nm torque. It adds that combined fuel consumption and CO2 emissions are noticeably low in all cases. And the most powerful model is a CLS 450 4MATIC 6-cylinder petrol version. Delivering eight-cylinder performance, its lower fuel consumption is revealed in levels once the exclusive domain of high-voltage hybrids. Data claims the CLS 450 4MATIC delivers 270kW/367hp, 500Nm torque with combined fuel consumption of 7.5-litres/100km and CO2 emissions of 178g/km. A dynamically set-up steel comfort suspension is standard. Optionally available is a sporty set-up with continuously adjustable damping at the front and rear axles with selectable comfort, sport and sport plus modes. Air suspension is also offered.